Lets Grow, Become a Franchisee / Sub Broker ! Best commodity trading brokers in india Get a chance to Earn more than Rs. 50,000 per month! 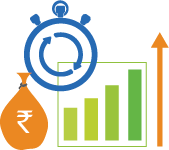 Best Lowest Brokerage Charges in India Get a chance to Earn more than Rs. 50,000 per month! 500perCrore believes that knowing about the company you are investing with is key to your trading success, which is why we recommend that you look over this section of our website That way, you will discover why 500perCrore is one of India’s well-reputed place to find the suitable trading experience for all kind of Indian stock and commodity traders. 500perCrore is leading the way in online with a focus on providing unparalleled trading services in EQ, stock futures and options, Index futures and options including world major indices, currencies and commodities with India's one of the top ten brokers 500perCrore where we have mutual agreement to support our clients. EveryWeek Free training to understand the Market Scenario. We Provide Sure Shot quality live calls and follow up of calls. Discount brokerage just R. 499 per month in India & 20 Times Limit for MCX and Nse Futures online Trading account. Visit our discount Brokerage section to check the other charges which has No Hidden charges at lowest brokerage for commodity trading. Highest Intraday margin For commodity trading up to 10 Times at lowest brokerage also called discount brokerage & zero brokerage. 500 Per Crore Provides backoffice Support to its Franchisee. I have been in capital markets since 1978 first time i have come across the most efficient broker like 500 per crore markets giving an excellent service which every investor should be looking for. I am extremely comfortable and happy with services! Knowledgeable staff, Very specizalised departments, No matter what they handle themselves in professional manners- Love to work with 500 Per Crore. Fantastic Customer Service and You can rely on them, Not primarily in looks, but in the back office / ease of use and ease of changing options / parameters. Service is providing highly scalable and robust service to meet the needs of me with sophisticated tools and technology which are easy-to-use. I’m recommending anyone I know to check out you an improved and updated website, which is very competent / better than many others in the field..
500 Per Crore taught me how to do trading in share markets. They are reliable, helpful and you can expect any reply from them for any questions within 10-12 hours!